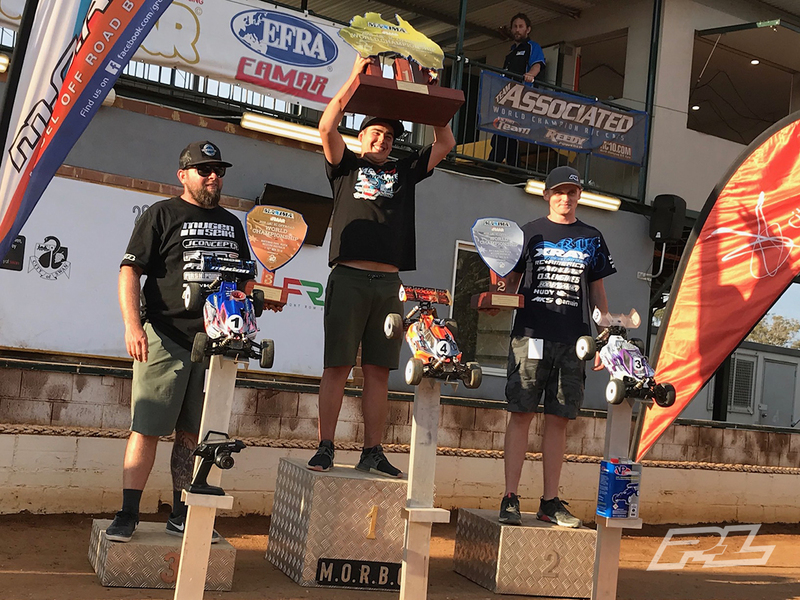 The marathon race that was the IFMAR 1:8 Fuel Off-Road Championships has come to an end. This year the race was held in Australia at the MOBRC club track in Whiteman Park, Perth, Australia. The club did a great job of preparing the facilities with the comfort of the racers in mind. There was ample pit space, cleaning facilities, great food and lots of spectator seating. After 20 hours in the air we arrived in Perth on Wednesday October 31st, after checking into our cabin at Discovery Parks, we headed to the track to check it out. The track looked great and I was excited to get practice started. Practice started Thursday at noon on a fairly loose track, as the club anticipated, but as the surface wore down, it developed a clean line to make a good racing surface. The watering schedule was to be water every 4 heats which would be water about every 50 minutes, so depending on what time of day your practice heats were you could experience quite different track conditions from round to round. This made the race extremely challenging to try and determine setup and make good tire choices. I was able to seed 3rd fastest in practice and would be in the first heat of two where the fastest 24 seeded drivers would run. Once qualifying started the watering schedule changed to about every 40-minutes, and again depending on what heat you were in you have to make choices on tires and setup and hope you made the right ones. For qualifying I was able to TQ two of the rounds and finish 5th and 2nd in my other two rounds that counted, to give me the overall TQ with 7 points. Qualifying was definitely a challenge with the ever changing track conditions so it really kept us on our toes with some good setup and tire changes and some not so good. Friday was a rebuild and prep day, we arrived at the track at 8am to start working on my car and support our team drivers that were racing and well as help out anyone who needed setup advice or engine tuning. We left the track around 6:00 that night to get a good night sleep and be well rested for main day. Saturday we were at the track bright and early to make sure that we were ready for the A-Main warm ups, with 4 Xray drivers going directly to the semis we knew it would be a busy day. For the warm ups we tested tires and some setup changes and felt we were ready for the semis. My semi was up first and although I felt I chose too hard of a tire I was still able to take the win, but I had made a few mistakes in the semi which made it slower than the 2nd semi so I would start 3rd on the grid for the Main. In the Main I felt that I had good enough speed but made mistakes on my own and lost touch with Davide Ongaro, congratulations to Davide on an amazing drive on what were extremely challenging track conditions. 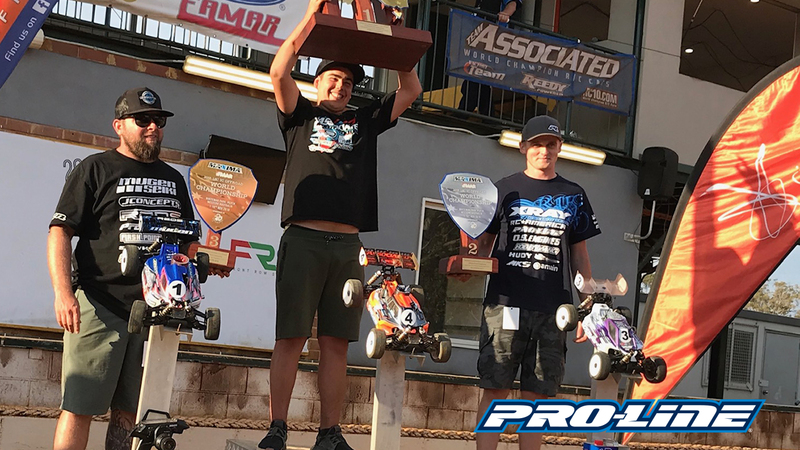 I want to thank my sponsors for giving me the opportunity to race with amazing products, Xray, RC America, Pro-Line, OS Engines, Hobbywing, MKS, VP Fuel, A Main Hobbies, Protek RC, Hudy, Lunsford, Avid, StickIt 1, Darkside Designs, OCRC, 110% Racing, MR33, Live RC, Red RC.